For every person I talk to who says their parent or grandparent or aunt or uncle wants nothing to do with computers or the Internet, there seems to be a grandma taking the Internet by storm. It is true that computer use, Internet use, and mobile device use are lower among older adults than other age groups (especially among the “oldest old” defined as those 80 and older). That’s not surprising. Technology wasn’t part of the fabric of world when they were in school or the work force as it is now. While it seems younger folks need to make a conscious decision to disconnect, older adults may need to make a conscious choice to embrace technology. Despite ageist stereotypes many older adults are choosing to do just that. Tech use among older adults is rising at an impressive clip. Four in ten older adults own a smartphone which is two times more than in 2013. Sixty-seven percent use the Internet. The barriers to gaming among older adults are similar to the barriers for the use of other technology. They include access, attitudes, and ability. The data on Internet and smartphone use above suggest that access barriers are declining. However, some research suggests that adults are more likely to believe video games are a waste of time and older adults in particular may not want to be seen as childish (a perhaps natural reaction to society’s ageist tendency to infantilize older adults). And there are some potential issues with changes in eyesight, cognition, and motor abilities that may make fast-paced action games less popular for many older adults. Much of what we know about gaming habits to date are based on surveys or focus group studies that ask about gaming habits and reactions to descriptions of games. These studies suggest that when older adults do play games they are less likely to play immersive action games. Computerized versions of card games, board games, and puzzles are more popular. What’s missing is research that tracks actual gaming behaviors of older adults. A recent study by an interdisciplinary team including researchers from psychology, engineering and kinesiology tracked gaming behaviors among a sample of 150 adults aged 65 and older over the course of a year. The study was a secondary analysis of data from a randomized controlled trial testing the effects on social isolation of a system called PRISM, or Personal Reminder Information and Social Management. The PRISM system was installed in participants’ homes and they were given three training sessions and follow up calls one week, three months, and nine months later. This study reports on usage data over the course of a year, specifically use of 11 single player video games that were part of the system. All of these games were computerized versions of card games, puzzles, etc. based on what previous research found older adults prefer. Older adults played a game on 42% of the days they accessed the system. Games were one of the most used features after email and the Internet. Almost half of the sample (49%) had the equivalent of one month or more of days of game play. Solitaire was the most played game. There was a slight drop in activity over time, but gaming continued over the course of the entire year. A group who played the most frequently and almost exclusively played Solitaire. A group who played Solitaire almost exclusively, but less frequently. A group who played a range of games. A group who used the system for fewer days on average than other participants and did not play many games. There were no clear predictors of game play except total number of days using the system. Not surprisingly, those who were in the system more played more. Game use the previous week predicted more non-game system use the following week. That last point is something I find particularly interesting. It may simply be that those who used the system were going to use the system and those who used the system were also more likely to play games and keep using the system. It might also be, however, that having access to the games kept people coming back and while there they were more likely to use other parts of the system as well. Telehealth is a growing part of health care and can range from devices in the home to track and report health indicators like blood pressure or blood sugar to virtual doctor visits in rural areas. Telehealth has potential to improve access to care, not by replacing human interactions, but by facilitating the real time sharing of important information and timely communication with health care providers. While playing games to telehealth may seem like a stretch, for telehealth to work people need to be willing and able to interact with the technology tools (that includes the providers as well as the patients – perhaps a conversation for another day). This study suggests that including games or other reasons to log in might encourage some older adults to use other parts of telehealth technology as well. What do you think about older gamers and/or telehealth? I’d love to know. Drop me a line or post in the comments below. Where Did Dr. Google Get Her Medical Degree? The flippant title aside, according to a 2012 Pew Research survey 35% of adults in the U.S. have gone online to diagnose a medical condition. Another study found that of the 60% of adults aged 55 and older who reported using the internet in 2012, 80% looked for health information online. It’s no surprise that using the Internet for health information has increased over time. This is true across the board even though there continue to be differences in Internet use by age, education, and income. This use of online sources is likely to continue so it’s worthwhile learning more about it. What does health-related information use look like? One of the nice things about Pew is that you can download their data and play with it yourself. (Those of you have followed this blog in the past know that I love to play with data). So I did. The sample for this survey included 3,014 adults in the US. Their age ranged from 18 to 99 with an average of 53. Over half were married or living with a partner. About a quarter had never been married and the remainder were divorced, separated, or widowed. A small proportion had less than a high school education, half had a high school degree or some college, and 37% a college degree or higher. Almost three-quarters were White, 19% Black/African American, 3% Asian/Pacific Islander, 1% Native American/American Indian, and 3% identified as mixed race. Over half had less than $50,000 in family income. The survey includes a range of questions about health, caregiving, and Internet use. I focused on the Internet use questions that seem most relevant to my interests of older adults and caregivers, although here I look at the full sample, not just older adults. Among those with a serious health issue, about three-quarters reported getting information from a health professional, 62% got information and support from family and friends, and 24% got information from others with the same condition. Most people made these contacts offline. However almost one-third used both on and offline methods with family and friends or with others with the same condition. More of those without a chronic illness used both on and offline methods to get info from family, friends, and others with the same condition. It seems like people with more health issues are more likely to stick to traditional offline communication and information gathering. Over half of the sample reported providing unpaid care to an adult relative or friend in the past 12 months. Sixty percent of those said the Internet was helpful in providing care overall and half said that the Internet helped them cope with the stress of caregiving. 67% of the sample said they looked online for some type of information. Looking online for information about a specific disease or medical problem or certain treatments or medical procedures were most common. 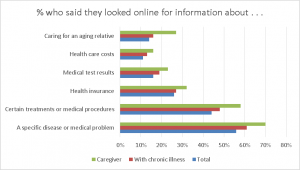 Not surprisingly, a higher proportion of people who had a chronic illness or were caring for someone reported looking online for information across all categories. It seems like Dr. Google has a pretty good practice going. That is not necessarily a bad thing as long as people pay attention to the sources they are pulling information from and evaluate the quality of that information. Of course, we all know how easy it is to find unreliable and inaccurate information online and sorting out what’s credible and what’s not can be hard. Going to sources like the Mayo Clinic and the National Institutes of Health or organizations that focus on a particular illness, such as the National Stroke Association, can be one way to insure you’re getting solid information. Talk with your doctor about medical information you gather online. Of the people who said they went online specifically to figure out what medical condition they might have, half said the information convinced them they needed to see a doctor. Of those 67% said they actually talked with a medical professional about what they found. That was actually more than I would have guessed, but still raises questions for me about how people are evaluating and using medical information they find online. What do you think? Do you use Dr. Google? If so, how?